Preheat oven to 375 degrees. 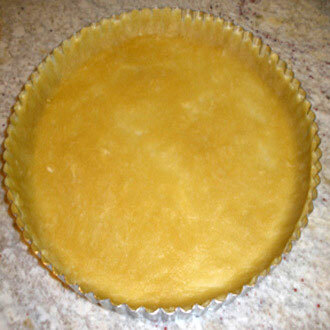 Lightly grease a 11-12" tart pan. Turn out onto lightly-floured surface and knead gently 4-5 times until it forms a ball. Roll into a circle large enough to fit pan, using only enough flour to keep it from being too sticky. Most importantly, don't overwork the dough or it will become tough, not tender. Gentle transfer to pan, trimming excess and let rest in the refrigerator for 30 minutes.